As you know, I have agonised about the hall and what to do with the floor there for some time. 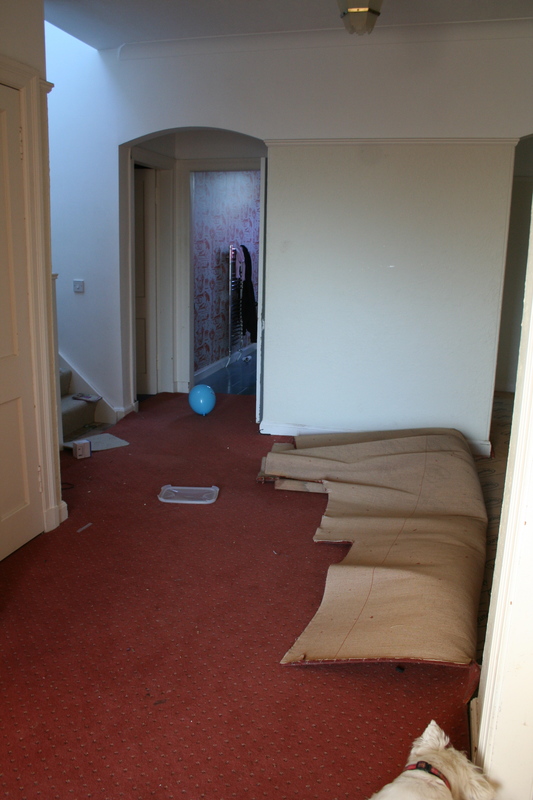 My parents went to a lot of trouble to get the hall carpet laid flat and true and put plywood under the underlay to make it as perfect as possible. Trouble was, although it was very good quality carpet that had been laid to perfection, it was just not my thing, peach never has been, sure you could call it coral or something but all I see is peach. Peach has been on my ‘no way never, ever’ colour list since someone of my acquaintances had the misfortune to have a full on peach bathroom, from shower curtain with frills to the toilet paper and everything else too, there was probably peach scented spray in there, undoubtably from Marks and Spencer. 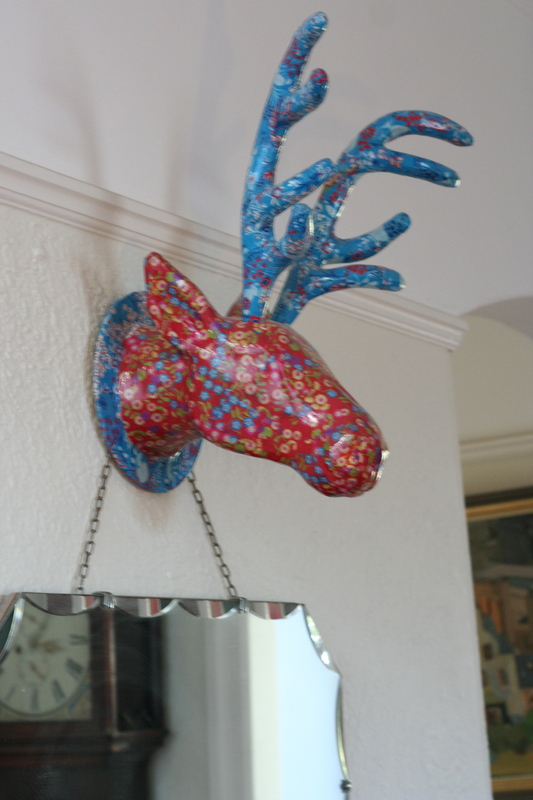 The person in question did not inherit this, they chose it, no idea why. 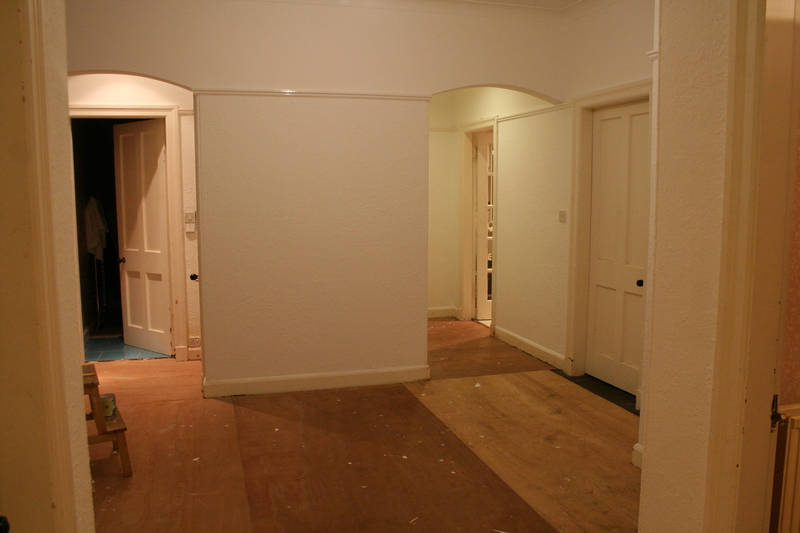 Back to the hall, it is now white, the colour of the floor has been chosen and I will show you the final result soon, it has not even been finished yet! By the time a little girl I know is hosting her birthday party here, on Saturday, it will be all new and shiny for little feet to tramp across on the way to the fun. Can’t wait! 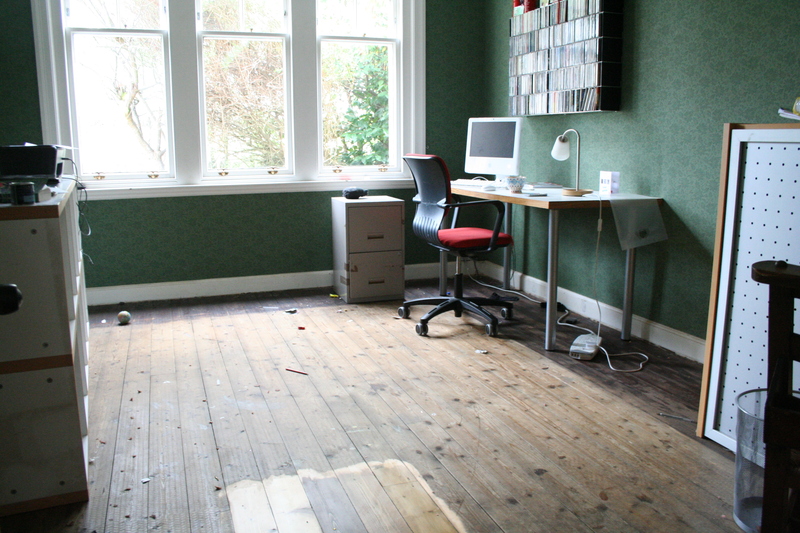 Here are the before and half way shots for you, I wish I had taken the carpet out and lived with the plywood, really, it is so much better than the peach. I am looking forward to sharing the photos of the floor with you, more than that, I am looking forward to a ‘peach free’ home, wonder if it will ever become the thing again? Not here, no way! 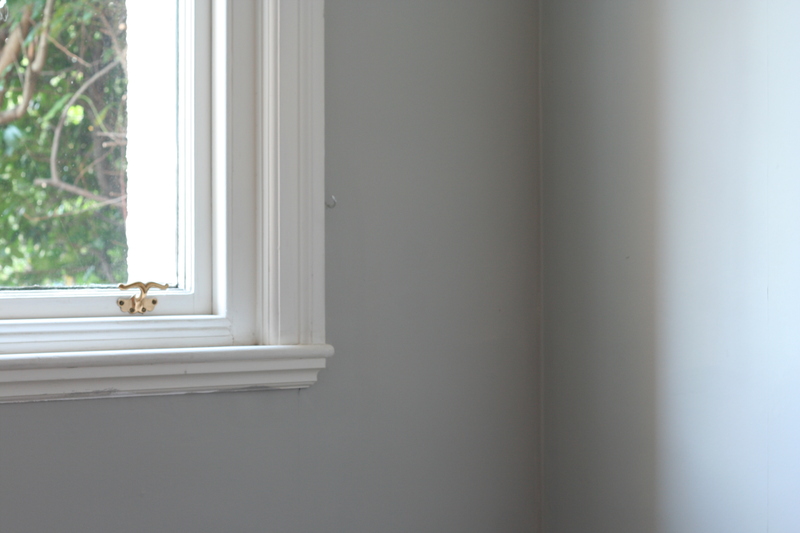 Well, here’s the new colour in the middle room, after literally hours of staring at the different coloured samples on the wall, and discussion, C chose this one. Our lovely F hates it ‘more than white’, but what does he know, soon he’ll only see the desk and the computer in there. This colour is from good old Farrow and Ball, it has the usual ability to look different dependant on how the light is hitting the room. Most of the room was painted on Monday but, being this time of year, I had not actually seen it in the daylight until I got home from work today. The final cutting in at the cornice was done today and I must say that I am quite proud of my work. Sure, there’ll be a bit more finishing off to do tomorrow, up the ladder. Then it’s action stations on the hall. By Monday it will be painted, all we have to do is decide on the colour…..simple. It definitely won’t be red as F suggested, that’s for sure. 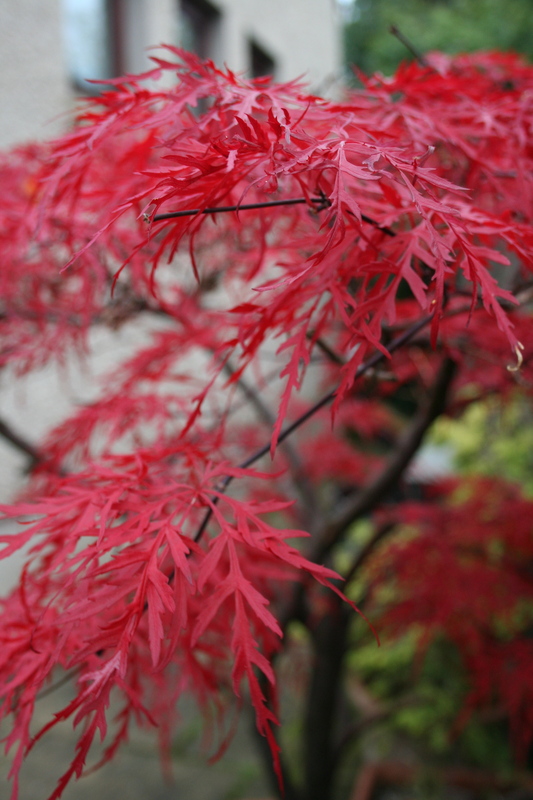 This amazing Acer caught my eye when I went to check up on the guinea pigs this morning, the colour has changed to the most vibrant bright reddish pink almost overnight. It’s in a pot and has had a couple of ropy phases since the bad snow years, so glad to see it in full magnificence again. The ‘middle’ room is to get the floorboards done at the same time as the hall and, since it’s empty, we have decided to go for it and change the wall colour too. When the sun is shining it is a beautifully light room and those windows are amazing, they let light all the way through to the hall. It can be quite dark though because of the green damask print wallpaper which I quite like actually but it does not fit with the way I’d like it to look. 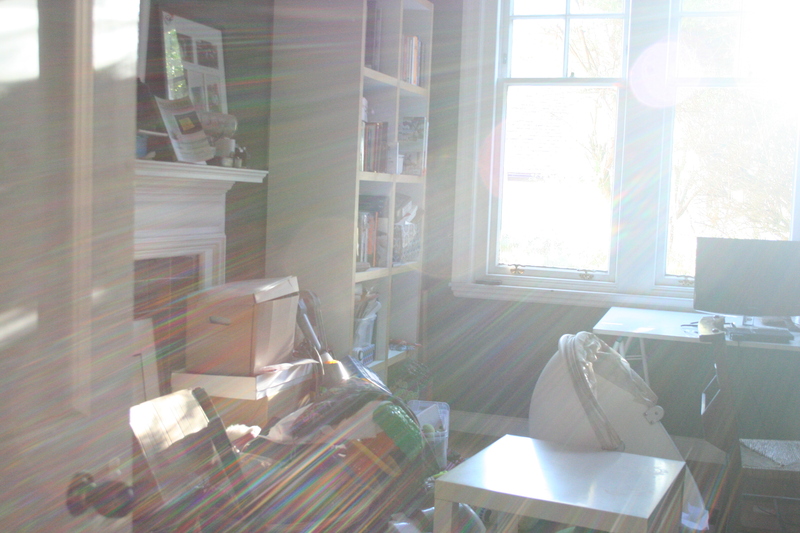 Light, bright and fresh is what I’m thinking with an array of colours coming from our belongings on the shelving. Here’s how it looked last Friday before the mission to clear it out started, it had become a dump. 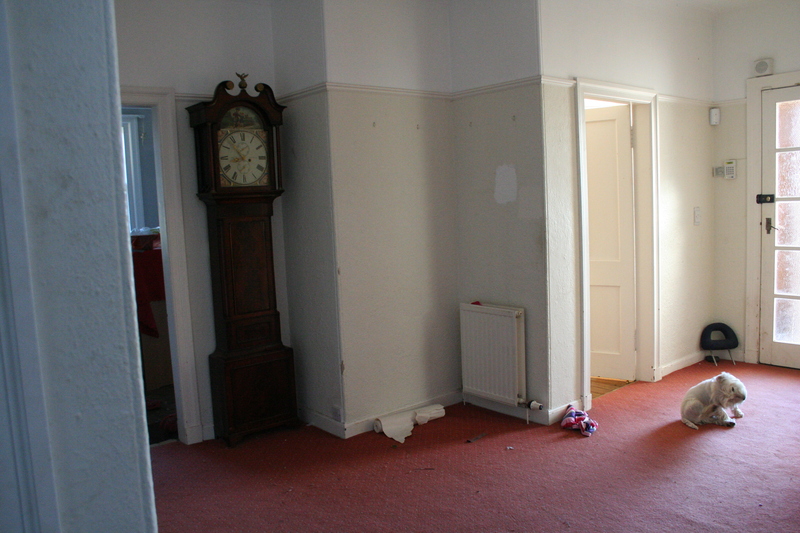 We all have our own little visions for this former dining room. Playroom, study, music room, library, snug or games room, it is my goal to make sure it stays a bit more organised and pleasant to visit, whatever it is used for. This is how it looks right now, as I type. Imagine me sitting on that hideous red chair, which will not be coming back in, if I can help it. There should be a new version to show you on Monday, this weekend is painting weekend, once we decide on a colour. There is a beautiful blue in my mind’s eye but who knows what colour you’ll see in the after photo. 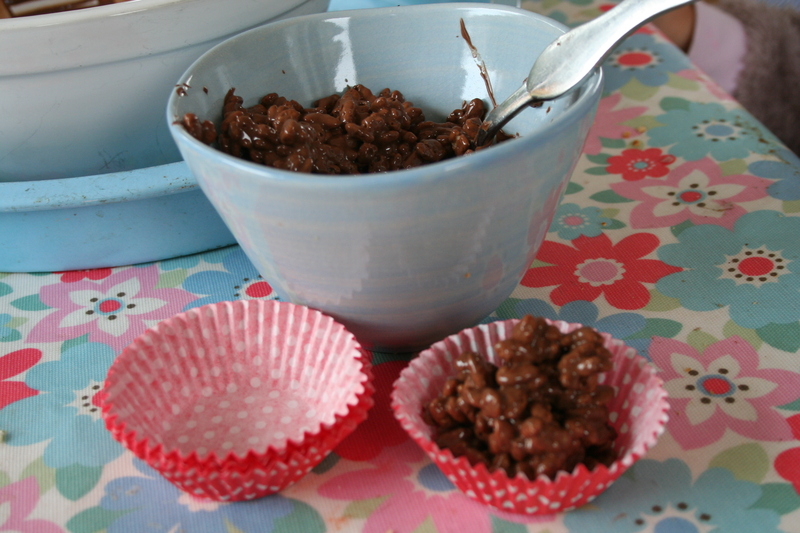 My promise to H yesterday was that we would make chocolate crispies with her friend when she came to play. Yum, hope there’s one left for me.